01 - In Microsoft Office, start Outlook and look for the Toolbar. 02 – Now Click on "New E-Mail" and when the new window appears, click on "Signature" and then click on "Signatures". 03 – The "Signatures and Stationery" window should now open. 04 – You can either add this to your current signature or create a new one. 05 – Assuming you are creating a new one, click on "NEW" and type a name for it. 06 – Where it says "CHOOSE DEFAULT SIGNATURE," under "NEW MESSAGES" locate the name of the new signature you created. 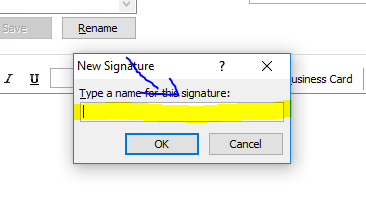 07 – In the "EDIT SIGNATURE" box, look for the picture icon that looks like a mountain and sun together and click on it. 09 – Now where it says "INSERT" or "CANCEL" please click on the little arrow next to the "INSERT" button and now select "INSERT AND LINK." 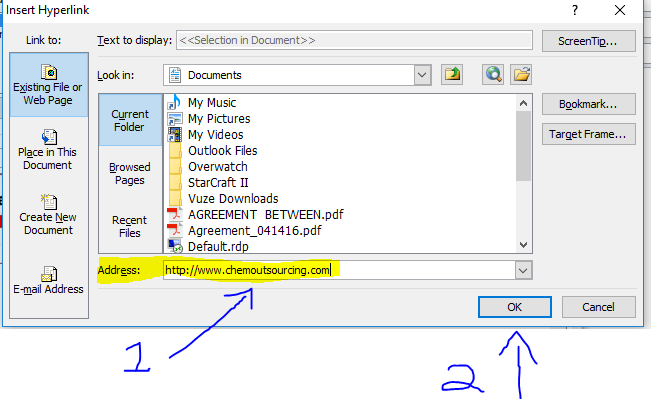 10 – Outlook will save your information and the "Chemoutsourcing 2017" banner should now appear. 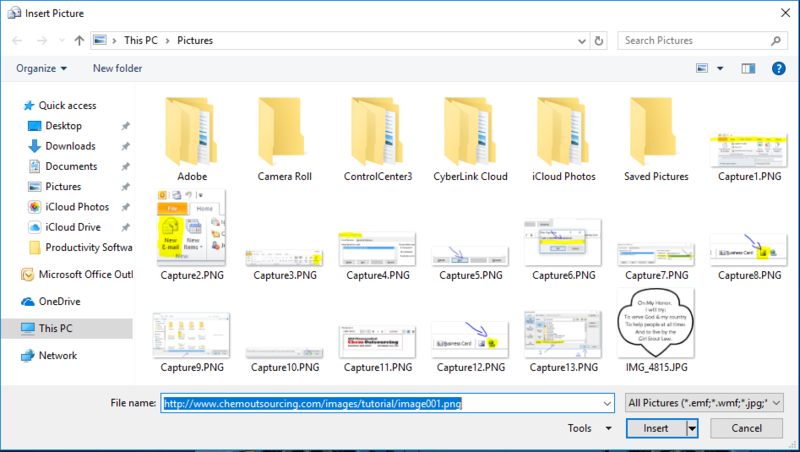 11 – At this point, SINGLE left-click on the banner in the signature file until you see 8 resize squares. 12 – Once you see the squares, you’ll need to click on the icon NEXT to the mountain and sun icon. It looks like a planet with a chain link underneath it. 13 – This will bring up another window. In the "ADDRESS" line, please type in: www.chemoutsourcing.com and click on "OK."
Now the Chemoutsourcing 2017 banner will appear in every email and your email recipients can simply click on the banner to be taken directly to the "Chemoutsourcing" homepage.